Peter Harris gave an address to the National Housing Conference 2015 in Perth on 29 October. 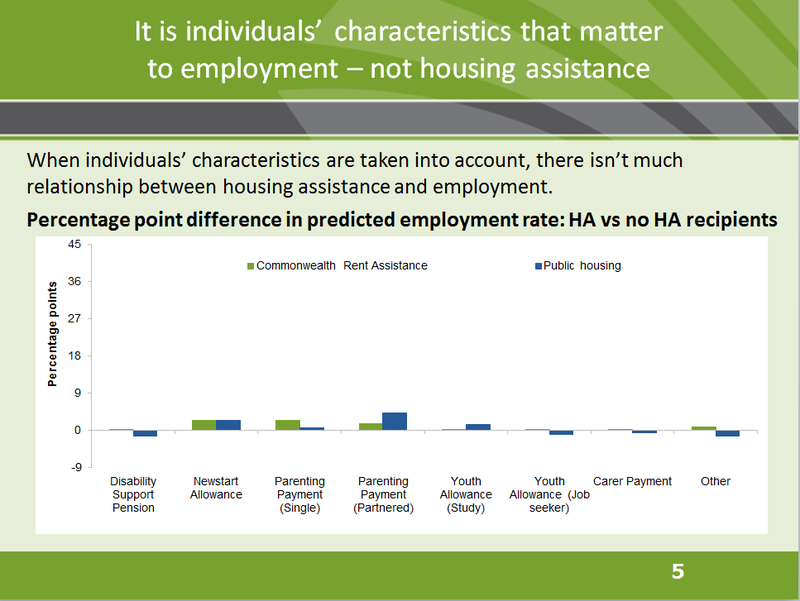 In April 2015, the Productivity Commission published a research report undertaken of our own volition on the role of housing assistance (social housing and Commonwealth Rental Assistance) in influencing employment for the least well off in Australian society. 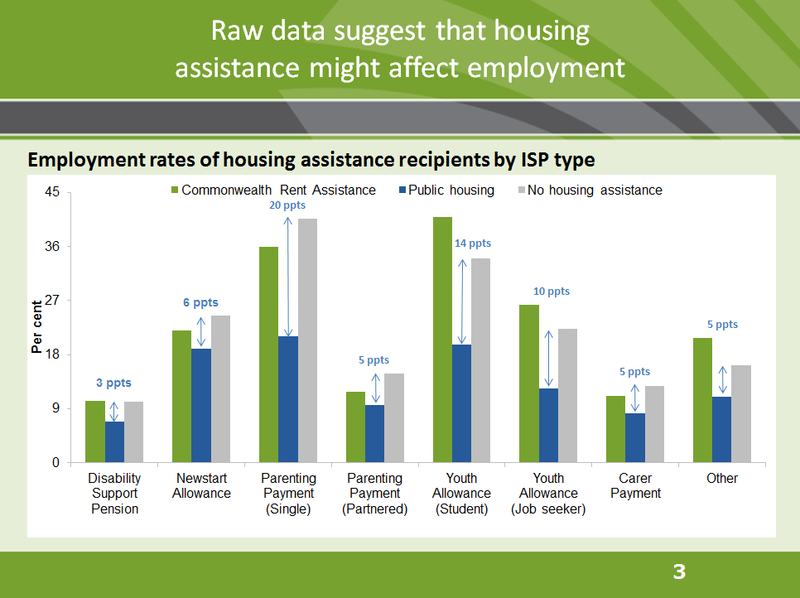 First - to examine employment rates by housing assistance type in Australia and assess whether those rates were influenced by that assistance type. Second - to use Commonwealth and State administrative data sets to prove up their value in undertaking this kind of analysis. Our working hypothesis for the research - we like to apply the scientific method in at least the broadest form of an hypothesis - was that a move from the provision of public housing at subsidised rents towards the provision of Commonwealth Rental Assistance (CRA) should improve the employment prospects of public housing tenants. This was a pretty straightforward choice, as the theme of Commonwealth-State public housing policy over the last decade or so has been in this direction. 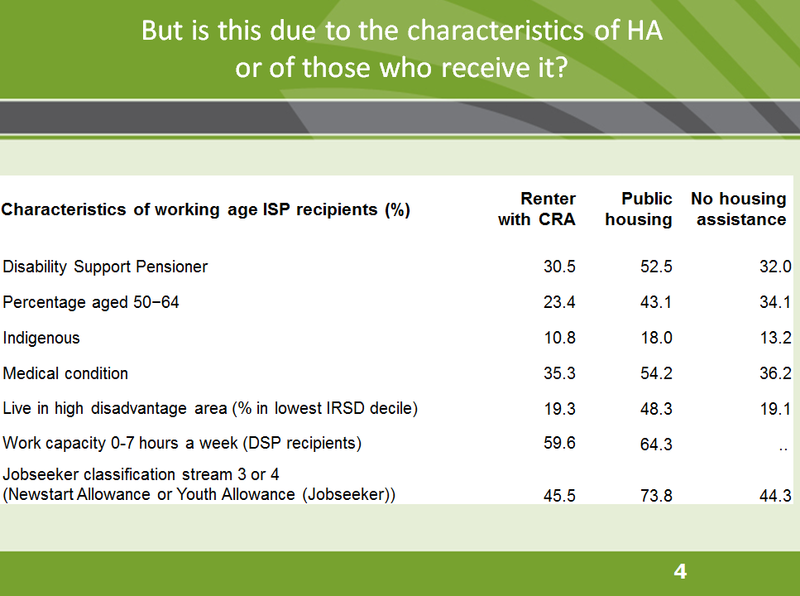 To test this, we looked at the relationship between the different types of housing assistance and employment. We also looked for evidence of welfare locks - i.e. whether the employment levels of prospective public housing tenants did not improve while on waiting lists; and what happened once entry to housing was achieved. And we looked for factors that might have supported improved employment rates, such as the stability effect. And, finally, we considered effective marginal tax rates (EMTRs) faced by income support recipients who receive housing assistance. And we did this with the different housing assistance withdrawal rates - and thus different EMTRS - faced in public housing versus Commonwealth Rental Assistance (CRA) in mind. From the outset, however, we were in somewhat unknown territory. This was because the second target of this research - to use Commonwealth and State administrative data sets that are presently not accessible to third party researchers, but contain very attractive data in their raw forms - was a bit of data jungle. The information was generally not being recorded nor curated for the purposes of research and evaluation of programs. Nevertheless, this demonstration of the utility of the data sets was an essential element in our decision to commit significant resources to this project. Admin data is generally poorly available for research in Australia, by comparison with overseas. The UK has developed the Administrative Data Research Network (ADRN), launched in 2014, to give accredited external researchers access to de-identified administrative data in a secure environment. New Zealand has the Integrated Data Infrastructure (IDI) completed more than two years ago which includes economic, education, migration and business data. Justice, health and safety are being added and the Inland Revenue updates tax data every three months. Researchers can apply for access to micro-data through an accreditation program. Canada and Scandinavian nations all do better than Australia in actively directing holders of administrative data - that is, government agencies - to link and curate data bases so that third parties can use them to assess current policy directions; or test hypotheses about new ones. When I say 'directing the data holders' I mean that without prejudice. Direction - preferably central direction from the core of governments - is needed to overcome the perception (or the reality) of Ministerial nervousness about opening up admin data for ready use in public discussion; and in critical program evaluation. As we noted in our 2013 Annual Report, direction is needed to shift this issue from being one occasionally promoted by the odd internal champion of reform of data access to one that is a primary function of Departments with major data bases. Some part of nervousness in the use of admin data is also linked to concerns about privacy. But many developed nations have privacy laws similar to ours and yet do better than Australia on making their administrative data available. Even the US, home of the zealous litigator, has better access to administrative data than Australia. The US has set up Data.gov with an exceptionally wide variety of data sets for public use. You can view, as just one example, the costs of diagnosis of medical conditions from more than 3000 hospitals across the US. There is a wealth of data sets on retirement and welfare benefit recipients including one covering approximately 800 000 plans. As the National Commission of Audit noted last year, there are over 200 000 data sets of this nature readily available in the US. In Australia, at the time of their review, there were about 3000. There are now about 7500 but still a fair way to go. And although it is often hinted at, one thing we know from our work on the project I am discussing today, is that cost is not the real impediment. Yes, there are costs associated with the development and curation of admin data. In our housing assistance project, we used de-identified records from two Commonwealth data bases and two State data bases. The Commonwealth examples are the Research and Evaluation Database (RED) of the Department of Employment; and the Centrelink payments database managed by the Department of Human Services. The State data bases were the public housing records (for applicants and tenants) of South Australia's Department for Communities and Social Inclusion and Western Australia's Department of Housing. 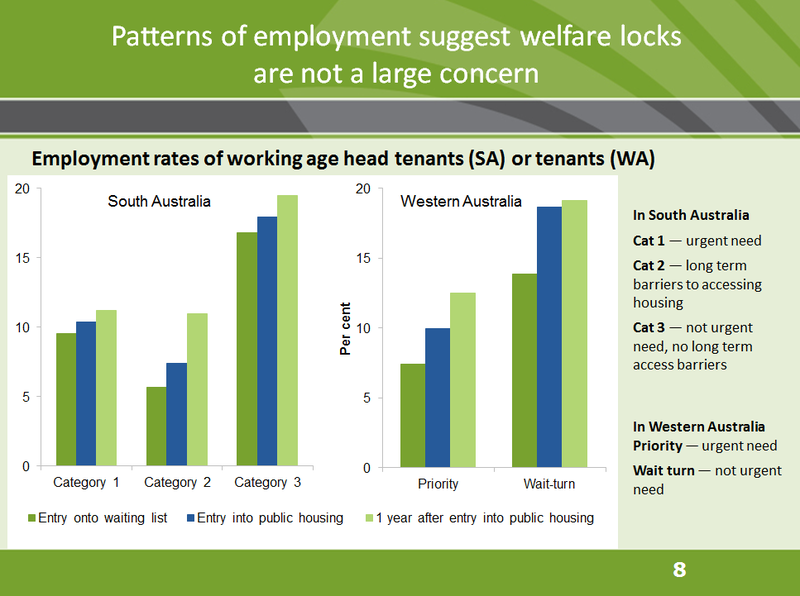 The Department of Human Services data base for Centrelink was able to provide, after some effort, annual snapshots of the employment status of working age housing assistance recipients over a decade to 2013. At 30 June 2013, of some 2.5 million recipients of income support of various kinds, in excess of 1.2 million received housing assistance of one kind or another. This is by any measure a very substantial population for the purposes of analysis. The RED was initiated over twenty years ago and has been maintained by a handful of officers in the Employment Department over its many bureaucratic moves around the Canberra Departmental scene. It was the most effective source for continuous scrutiny over long periods of the employment status of income support recipients because we could track people over time. The State data bases were not identical but each involved over 50 000 households and allowed examination of employment and other factors over a similar period as applicants moved off waiting lists and tenancies ended. The cost involved in de-identifying data, assembling it in an analysable form and ensuring consistency was not minimal, particularly in the case of DHS and State agencies. Small teams - of the order of 3 or 4 officers - were required for periods of a month or more. DHS estimates that its total commitment was 6 weeks work for 4 officers, amounting to half a person-year. The process of passing internal scrutiny from guardians on issues like privacy was also not zero. But in total none of these costs - even including our own equally small team of researchers - was more than marginal when viewed against the normal administrative costs of these agencies; or when considered against the costs of the programs involved. Nor is it more than when viewed from the perspective of the clients involved, if indeed there is a better way of housing people while not impeding their engagement in the employment market. What we proved, to our satisfaction and that of DHS as our primary Commonwealth partner was that the data sets are developable for purposes like this. The big question is the one for governments: why is it that there is no central direction on making better use of these resources? To return to the research project itself, let me show what we found. 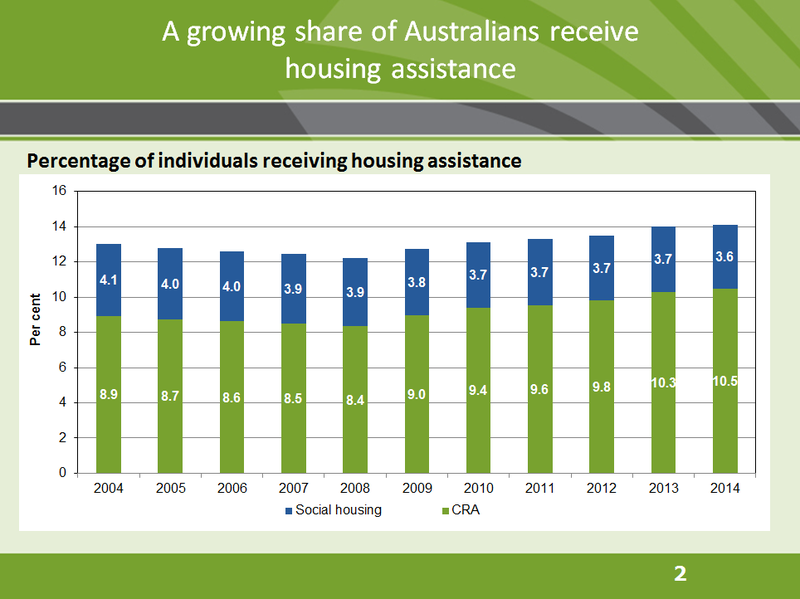 A growing share of Australians receive housing assistance, in 2014 about 14% of the population. While dedicated public housing units are generally slowly reducing in number, CRA (paid to community housing clients as well as those in private housing) covers an increasing share of the population. The cost of assistance is rising consequently. For the Commonwealth, the cost of CRA was about $3.9 bn per annum in 2013-14. And transfers to the States for other housing assistance were about a third of that again. The States and Territories too spend heavily on housing assistance, about $3.9 bn on social housing, the bulk of which is recurrent spending. While Commonwealth assistance is substantially directed towards using private housing stock, public housing is still very important to the most disadvantaged in our society. About 250 000 working age income support recipients and their children are housed in it; and many retired Australians as well. 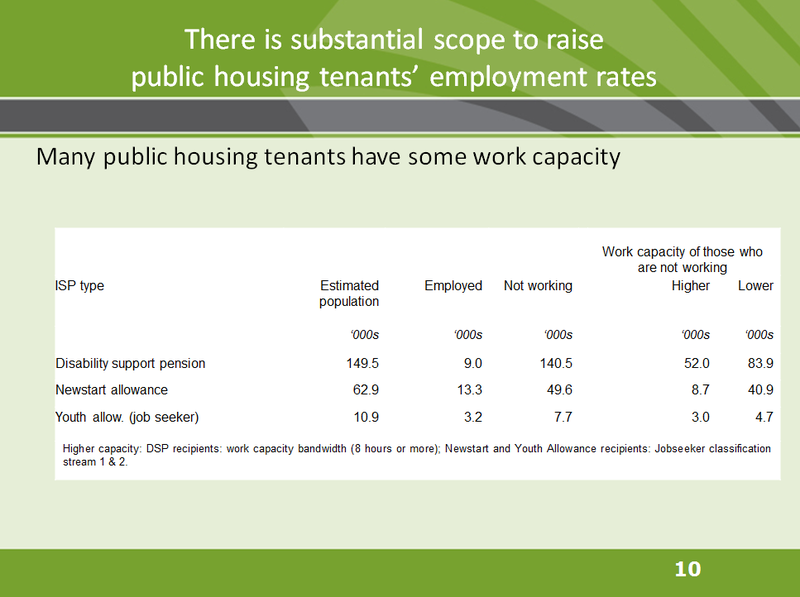 And there are notable differences between the employment rates for each type of income support of people in public housing, versus those with the same type of support payment not receiving any housing assistance. In rough terms, about 10% of public housing tenants of working age and receiving income support are also in employment; whereas about twice that proportion are employed among those who receive housing assistance via CRA. You can see why there is an assumption amongst some policy and political advisers that changing the housing mix or payment structure might change recipients employment outcomes. And that boils the question for our research down to this: is the type of housing assistance a person receives responsible for the differentials observable in this raw data? Using the RED data base, we could identify the characteristics of 230 000 working age public housing tenants on income support across Australia. And the characteristics of comparator groups, i.e. those without housing assistance and those receiving CRA. And we had a very large sample covering a sustained period to be able to test the characteristics of individuals for their contribution to the employment status of each group. In fact, the sample was of sufficient size, depth and longevity that we could apply statistical techniques that accounted not just for the observed characteristics noted above, but for unobserved characteristics - assuming, not unreasonably, that those characteristics remained unchanged over time. And the outcome, peer-reviewed for its technique and critiqued by the agencies which participated in the project, is that the type of housing assistance makes very little difference to the employment outcome. And that the significant factor or factors that drive employment relate to the characteristics of the individuals themselves. The significance of this finding is that policies that simply seek to alter the housing mix or housing subsidy structure of public housing tenants, with the expectation of altering their employment outcomes, are likely to fail. Policies that address the factors that are inherent in the individual are much more likely to be effective. This is a singularly important conclusion. It doesn't tell you what might work, but it does tell you what won't and where to look for what might. The case for lifting employment amongst public housing tenants does not rest on some moral judgment about reliance on welfare. There are benefits to workforce participation for the whole of society as well as for the individual. But having identified where to look for policies that might achieve this, there is another barrier to be overcome; the interaction of the welfare and tax systems. In the course of our analysis, we crystallised the effects on income of housing assistance withdrawal rates. The important point of comparison is the income ranges in which the effects occur. There are notable differences which are likely to have some impact on the return to work options for each type of assistance. Complicated-looking, but it shows for different income support arrangements, at what incomes and at what rates reductions in housing assistance occur. For CRA, withdrawal starts for Newstart at about 30 hours work per week. For the other payments indicated, it is up in the full-time employment income range. Part-time or casual work is thus not discouraged. For public housing tenants on any type of income support, withdrawal starts much earlier in the income range - usually, from the first dollar earned. 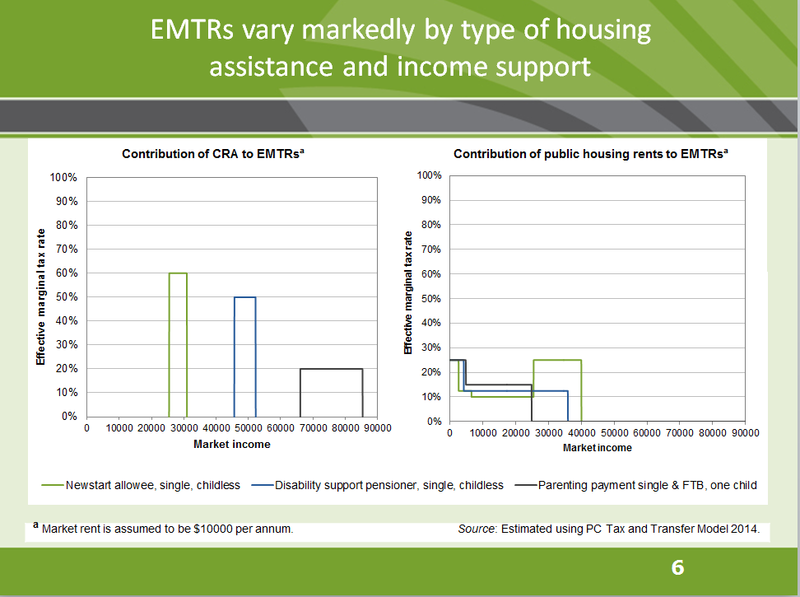 But housing assistance is only the start of the EMTR issue. 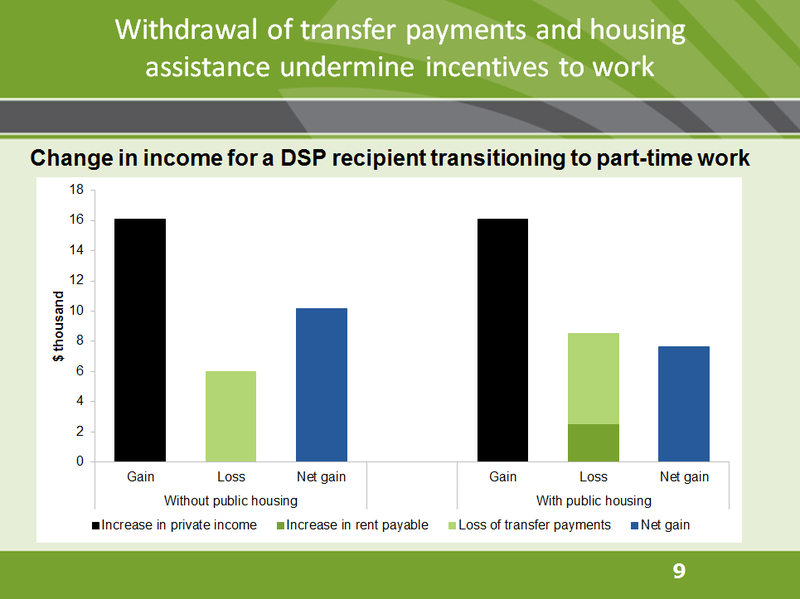 Much larger impacts, due to withdrawal of income support, are obvious in the next figure, which aggregates income support and housing assistance withdrawal. This is clearly a potential further barrier, particularly to public housing tenants, starting work or increasing their working hours. In the income ranges where it is most acute, it is a clear disincentive to part-time or casual employment, which are important potential pathways to full time work. You may be capable of working part-time (as we will see, there is reason to expect this), but if you did find such work you may well land right in the middle of the withdrawal zone, with EMTRs of 70% or more. Despite this, the data examined on a longitudinal basis showed that public housing tenants do increase their employment as they move into public housing and remain in it. But not by a large amount. For a new Minimum Wage earner, the net gain from a full-time job is roughly halved. 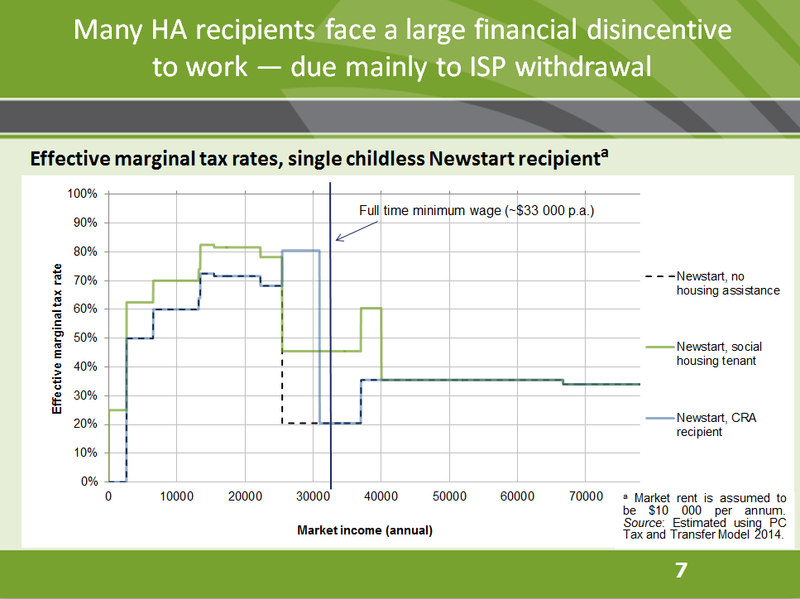 For Newstart, this may be acceptable: as a temporary assistance payment while engaged in job search, the incentive structure of high effective tax rates may generally not run counter to the policy objective. But it may not be so consistent with the policy intent for Disability Support (DSP) recipients. High tax rates due to income support withdrawal rates also feature in the Productivity Commissions very recent paper on Tax and Transfer Incidence in Australia . This paper shows amongst other things various participation tax rates (PTRs) for individuals encountering the combined effect of the tax and transfer system. That is, the effective tax rate faced by a person who is not employed and seeks to re-join the workforce. But that paper did not add in housing assistance. For today's presentation, we have done that. Here is the situation faced by a DSP recipient, one in public housing and one outside public housing, joining or perhaps re-joining the workforce on a part-time basis (working 2 and a half days a week at the minimum wage). The PTR for a person outside public housing is 37%. The PTR inside public housing is 53%. For Disability Support recipients aiming to find work and, say, engaged in the National Disability Insurance Scheme (NDIS) with the intent of overcoming personal barriers to work, the latter tax rate must be very daunting. And there are reasonable numbers of such persons. 140 000 DSP recipients are estimated to be in public housing and not to be working. While some 130 000 are assessed as capable of some work, of greatest interest are roughly 50 000 who are capable of a significant level of employment. While this might seem a small number overall, there are two answers to that. One is the simple human response to people who make an effort to seek work in such a situation; and the NDIS is in part expecting to lift participation rates, so there is policy consistency to be considered here. But the second is possibly more illustrative - in our 2014 Childcare and Early Childhood Learning report, we noted that about 16 400 women may in aggregate re-join the workforce as a consequence of those reforms. While viewed by some as a modest gain, seen against that benchmark, this is worthy of at least some policy thought. We suggest in the report one pathway to increase the employment outcomes for public housing tenants may be to apply intensive support for public housing tenants seeking work, accompanied by temporary - that is, incentive-based - slowing of the rate of withdrawal of income support and housing assistance. Programs offering this kind of structure - varying withdrawal rates of support for target groups drawn from public housing appear to work well - in the US. And with some similar thinking, the UK Government is seeking to directly address the EMTR question by creating a combined simplified single withdrawal rate. Australia is trialling bonus schemes as an incentive. As a delayed payment, the incentive may be less; although the administration is undoubtedly simpler. Overall, while it may seem a lot of effort for perhaps a modest lift in workforce participation, there is a case for further policy thought in this area.